Potato chips and projects are very similar. You are never satisfied with just one. And even if you eat so many chips or do so many projects that you feel a bit weak in the knees and unsettled in the stomach, it doesn't take too long to forget about the bad and continue with the good! And the beauty and frustration of projects is that once you finish, you just can't stop. You are happy you finished, but you immediately start thinking about how you can improve upon it and make the project even better! 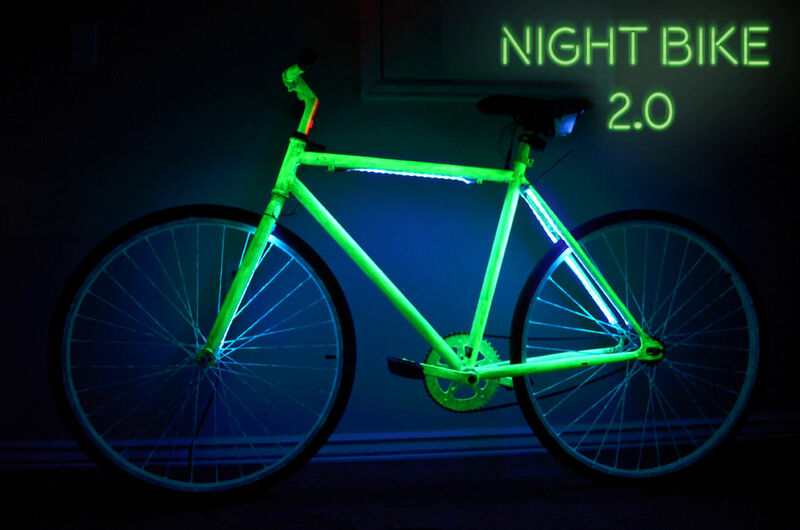 That is how I came up with Night Bike 2.0. The first version was great, but I thought I could make it even better. And in the two years since I first published Night Bike (seen here), I've revamped it into the far more advanced and sophisticated version 2.0. The hurdles I ran into while using my Night Bike were that the paint dimmed after awhile, and I preferred the crisp glow that you get just after charging the paint. I also struggled with my own space cadet nature and sometimes would forget to take it out of my work closet to charge before I left and then was sorry out of luck. I needed some more glowing security on a budget because I'm definitely not made of money! So after two years of tinkering with electrical circuits by dusting off some high school physics and a lot of help from the google, I've come up with Night Bike 2.0. This bike is fantastic, I can store it away in my closet at work and if I forget about it there is no need to worry! I can charge it as I ride. I added violet LED lights which are placed to evenly charge the paint on the tires as you peddle (the blue dulled fastest) and to charge the frame as well! There are many settings to choose from on the bike so it can just be extra "flashy" if you want it to be. Hopefully with this instructable you'll find this addition fairly easy, I've tried to endure all the headaches for you :) and as always I will comment if there are questions! > Matches (To heat the heat shrink tubing), heat gun will also work. Surprisingly bikes are very conducive to a lot of electrical wiring for lights! The frame itself is a natural way to conceal wires and to protect them from the elements. Alright so let's dig in! With a pencil in hand you will need to mark where to you have to drill in the frame of the bike. My bike needed a total of 18 holes. You want to try to minimize the number of holes you make! I started with the switch because I knew that I wanted that directly where the handle bars meet the top tube of the frame. It makes it easy for me to click on and off. So I put an x there for a hole. Next, I needed to figure out where I wanted the battery pack. I put it underneath the seat because that would hide it. I also wanted to make sure that in case I grew 6 inches in my old age instead of shrinking I could adjust my seat all the way up and still have the battery pack reach the lights. So I added an extension to be connected where the seat post meets the top tube. So now the top tube will have the hole to connect the battery pack to the switch and the switch to the rest of the lights! The battery pack will power the switch, and all other wiring will come from the switch making one continuous loop. So now I wanted lights on the bottom of the top tube, both of the back seat stays, the fork, the seat and the handlebars. Figure 1 shows this clearly. In order to light up all of these parts I began at the switch. I marked a small hole at the bottom of the top tube beneath the switch, and another one underneath the battery pack so the wire from the first light strip could go back into the frame. Next I marked a hole .... you know what this is too many words! Take a look at the diagram, that picture is really worth a million of my words. Also keep in mind that with a different bike layout you will need different holes. You are essentially creating a complex loop in your bike and you need to keep the loop connected, not broken, and the loop of wire is interrupted only by lights. The holes are there so that the wire will come out to connect the lights, and go back in the bike until it will pop out for the next light strand. Follow the arrows, or create your own schematic like the one below to help you through! will help prevent the drill from slipping, and preserve the paint. -As you maneuver around the drill, you'll find it isn't conducive to tight spaces. You might have to adjust your holes accordingly. After all the drilling, I had to put back on my patience cap to begin the wiring and pull out my sketched schematic to guide me. The switch that I bought came with a schematic (to let me know which was the power input, and which was the output for the lights), and it had a lot of excess wire. I saved this wire for extending the connectors, and that was really convenient because it has positive and negative wires in one bundle, so I didn't have to do the whole shindig twice. Be patient and be mindful! Start with the switch and end with the switch! Keep in mind you are making one loop. -When you feed the wire through the bike, it's so light that it might not pull itself towards the other hole. I did some improvising and using the chain from a dog-chain necklace, I crimped one end to the wire and fed the other end through. This made it heavy enough to fall towards the other hole. Then I used a bright light and some very narrow pliers to pull the wire out the rest of the way. Boiled down to a very simple sentence, for the wiring you are essentially connecting a bunch of connectors together with LED lights in between them. The dilemma here is that the connector pieces will not fit through the small drilled holes, and the wire is not long enough to be fed through some parts of the bike. So cut every connector in half. After wire is fed through the holes via the above method, you will then need to solder the respective parts of the connector to each end of the wire. Once the wire is through the holes, strip the ends, and put three pieces of heat shrink tubing on it. One piece for the negative wire, one piece for the positive and one over both. After a SOLID soldering job is complete use a match to shrink the tubing onto the positive and negative wire. A match just seems cooler than a heating device though that works too. Careful not to burn yourself or the heat shrink because you will have to start over. Then purely for aesthetics shrink the other piece of heat tubing over the two smaller ones. Tip: Please make sure that your soldering job is well done. You don't want a faulty joint holding you back at the end! Part 4: Power it up baby! The loop for the switch should now be complete! And that is fantastic... but you have no power! So now you need to supply a line of power to the switch to light up the hole bike. I wanted the power supply beneath the seat for easy access and concealment. The battery pack had an output wire that was not long enough in the event that I wanted to adjust my seat up and down. So I also had to cut that in half and solder in an extension. The schematics of the switch had a power wire and I wired that to the hole at the base of the seat and top tube. I soldered on the female connector so that the output wire of the battery pack would fit in nicely and could be disconnected at my own leisure. Put some batteries in the battery pack and you are so ready for TESTING the fruits of your labor! Get excited. And hope and pray that you made really good solder joints, and nothing went too far awry! But never fear, I have a troubleshooting section. Part 5: The Grand Reveal! If all the lights turn on, CONGRATS. Get yourself a nice mug of hot cocoa and admire the lights. More than likely one or more of the lights are not functioning. Before you pull your hair out there may be a quick fix! If more than one light isn't working, remember that this is a single loop, so if one light isn't working, then all the lights in the circuit after that one won't work either. So go to the first problem light and work from there. The first thing to check is the connector to light link. The connectors are cheap (I'm not made of money remember?) but they will work. I would disconnect the connector and try snapping it back on. If that still seems finicky, scrape a little of the excess plastic off of the top of the LED lights so that the connector teeth can more easily attach to the lights. If that doesn't work... then I'm sorry but it's time to check your soldering. If you have a volt meter, that is the easiest way to check if a current is running through your soldering joint to see if that is the problem. Also once you readjust the connector to make it work, you should definitely tape that sucker up so it doesn't get jostled out of place again. If you've tinkered around and still have no luck, give me a shout in the comments! I'll do my best to help you problem solve. So as I am looking towards Night Bike 3.0, which let's face it is inevitable, there are some thoughts I already have a brewing. 1. First of all I am looking to use a rechargeable battery pack with a waterproof case. That would ease my mind and my wallet with my current system of battery usage, it's just not sustainable. I've gotta go green! I would also like to find a means to velcro it to the seat (rather than tape, which isn't as classy). 2. Next I am in the hunt for clear electrical tape that I would use in place of the zip ties and to also reinforce the sticky substance on the back of the LED lights for a tighter bond. This clear tape could be used over the connectors as well to protect them from the elements. 3. Honestly, adding more lights couldn't hurt the bike at all! 5. It would be great to find a switch that would allow me to make the LED's "dimmable." That way they can be on all the time, but wouldn't steal from the star of the show, the glowing paint! It would be more of an enhancement to the paint rather than an entity all on its own. I am looking at this dimmer currently. Otherwise ENJOY the bike. Safety and Style. BOOM! I have a very primative setup compaired to this, but I repurposed a battery from an old laptop and used pvc glue to seal all cracks and holes. for attaching leds, 3M make a 2 sided tape for car moldings and emblems that you can find in most any auto parts store. it's thin foam so has some give to it for mild curves and textures, and since it's made for the outside of cars there's no amount of bike abuse that it can't handle. I love the effect and need a similar system for my vehicle but unfortunately the drill points will could weaken ANY frame material to the point of catastrophic failure . I suggest for no movement points you can pass the power thru adhesive copper strips used for PCB repair , paint or decals will cover. For the forks you can pass the power thru any small gauge wires wrapped around the break cables . my 2 cents keep working on it , it looks great . Thanks for the suggestion, if folks don't want to drill they can take a look at your tips. Though I am really confident my bike isn't near catastrophic failure even with a few small drill holes. It's sturdy as an ox. I'm an engineer you always assume the lowest poorest construction ... no one wants to see someone hurt ..
To help with tape adhesion, clean the area with rubbing alcohol then warm it up with a blow dryer, real warm. That's a good tip, I was just worried about the paint surrounding the LED, so didn't want to go too gung-ho with rubbing alcohol to clean it up. Back when I was in the custom car biz we used acetone and toluene to prep for attaching groups effect kits. I think rubbing alcohol would be safe. This was to remove any dirt or wax. Since yours is fresh, non baked, paint a real good washing would certainly be a must. As far as the holes weakening anything..... Someone needs to take their paranoia hat off and use some common sense. A 1/4" hole isn't going to weaken anything, even one of those bamboo frame rigs could stand that, and do during manufacturing. Another option for your tape/zip tie dilemma could be a hot glue gun. It dries clear and can be used to reinforce solders/wires/LEDs. Great ible! I didn't even think about a hot glue gun! I might try a dab of it. hahahahah thanks for the comment! Thanks for the instructable. One tape that is close to electrical tape that is clear is "3M Plastic Tape" It's a very good quality tape and comes in lots of colors + clear. There are also some battery holders which are 100% enclosed and could easily make them water tight (at mouser.com) They're only about a buck each. So which paint and source do you now reccomend? It sure would. I love the zipper bag you have for the electronics under the seat!